Our Verona Tile stencil is inspired by a classic European encaustic cement tile design, which is both beautiful and timeless. This cement tile stencil is perfect for creating a gorgeous painted tile floor, kitchen tile backsplash, accent wall or even a tiled table top! With our tile stencils, you can create a dramatic tile floor on a budget and save big on bath and kitchen renovations! 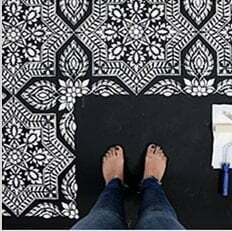 No need to rip out your old tile, as you can stencil right over it! Learn How to stencil a tile – it’s easy even for beginners! To stencil over existing floor tiles, first thoroughly wash your floor, let it dry, then give it a coat of adhesive primer (Stix is best in our experience), after that apply a base coat color (regular wall latex paint will do). Then, stencil your floor in acrylic or latex paint and finally seal it with two coats of water-based polyurethane for durability. How durable your newly stenciled floor will be? Very durable! In our experience the stenciled finish will last for years. We hear the same positive feedback from our customers about their durable stenciled tile floors. Just make sure to use the proper primer! Although most of our stencils do not require the use of spray adhesive, if your surface has a texture to it, it might be a good idea to use spray adhesive to help minimize paint seepage (Elmer's spray adhesive seems to be the best). Make sure you shake the can well and lightly mist (not drench) the stencil, and let it dry for a moment before positioning it on the surface you're about to stencil. This step will prevent the adhesive residue transferring to the wall. You'll need to re-mist the stencil after a few repeats. Note: you will still need to hold the stencil in place with a few pieces of blue painters tape! Adhesive by itself is not enough to hold the stencil on the wall. Clean-up tip: Spray the stencil with Simple Green to help to remove adhesive residue and let it sit for a while before cleaning with soap and water. Please note that it is virtually impossible to get rid of all adhesive residue. That's why we personally prefer not to use it and just stick with painter's tape! Stenciling on rough or textured surfaces may contribute to increased paint bleed. For more information on stenciling on textured walls, see our F.A.Q. section. Our stencils are made to the highest industry standards and with proper care and storage will serve you for long time.